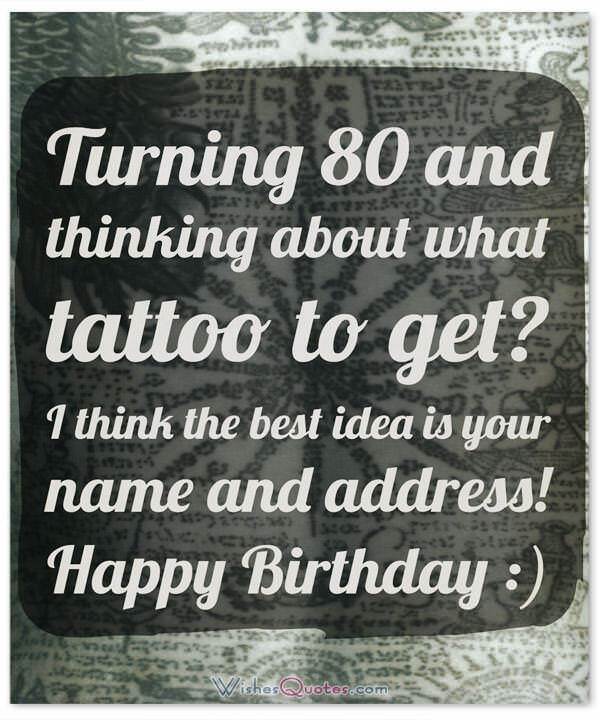 WishesQuotes » Birthday » Extraordinary 80th Birthday Wishes Suited for any 80-Year-Old! Extraordinary 80th Birthday Wishes Suited for any 80-Year-Old! 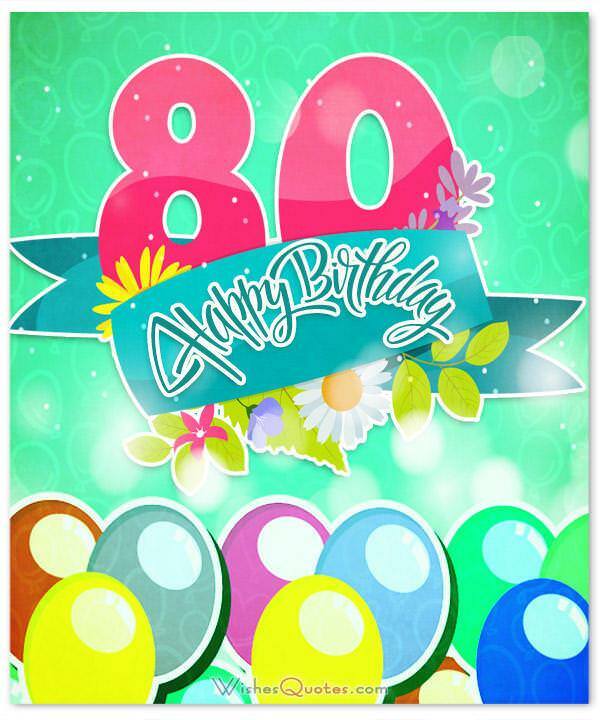 Amazing 80th Birthday Wishes to Send to your Family and Loved Ones. Share the happiness and spread the love to every newcomer to the 80year old club! 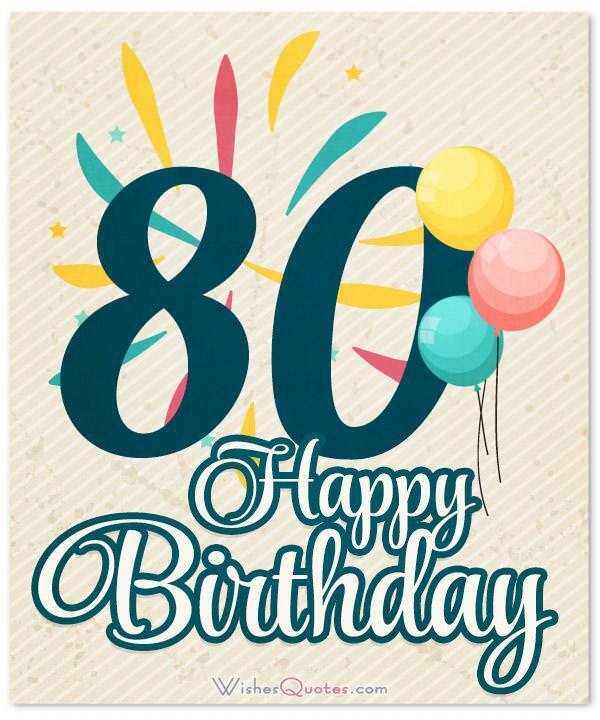 Browse through our amazing collection of the best 80th happy birthday wishes for your grandpa, grandma, dad, mom, husband, wife or friend! If you wish to show him/her that you care then there is no best day that using their most special day of the year to send them a message full of love and your most heartfelt 80th birthday wishes. But, most people have a hard time getting past “Happy Birthday!” so this is why we are here for! You can use these following wishes as inspiration, or take them as they are, and you are guaranteed to make any 80-year old feel like they are on top of the world! Ever since I was a child, I’ve been hearing endless stories about you when you were younger. Today, that legend from the stories turns 80! Ready to conquer more adventures Happy 80th Birthday! Your warm personality and amazing humor are what has made all of these family gather-ups and event to remember! Like the sage to a castle, you are the backbone of the family, and for that, we thank you. Happy Birthday! Today marks the 80th year of being the most amazing person in the world! I’d like you to celebrate this occasion with tons of fun and tons of food! Happy Birthday! You always have been, and always will be the parental figure of everyone around the house. Your endless wisdom and great intellect can guide us through the darkest of paths, into the light. Happy 80th Birthday! I’ve never been more proud to be related to someone before, you’re truly a special person and above all, a fighter. You’ve gone through 80 years of rough moments, bad experiences, sadness and grief, and pushed through with a smile For that, I congratulate you. Happy 80th Birthday! With every year you grow older, your skin may become more wrinkled, but your heart becomes warmer, and your eyes shine brighter. You truly are a marvelous person. Happy Birthday! You’ve lived enough to see the world change more than a snake changes its skin! And certainly, long enough to see me change from that naive little kid to the person I am today. Bottom line is, you’ve always been there for everyone that needed you, and for that, we thank you. Happy Birthday! May your 80th birthday be as unforgettable as your existence has been to our lives. I have no idea what we would have done if you were not here. Thank you, and happy birthday! If this day was an object, it would be the door leading you to brand new adventures, that you will now face, one year older, one year wiser, one year more amazing! Happy Birthday! Spending another year alive on this Earth is just one of your many accolades that you’ve gathered throughout the year, but I truly wish that it is the one that gets celebrated the most! Happy Birthday! Life is always a matter of perspective. Instead of feeling sad that you’re growing old, just feel happy that you got to lead such an extraordinary life when you were young! Happy 80th Birthday! Happy birthday to the person that became 20 for times in a row now! The fun fact is, that you don’t look one day older than when you were at that age! Happy Birthday! With your body slowly letting you down, you must always remember, that the only thing that matters is how you trained your soul so that you can leave back a legacy worth remembering, Happy 80th Birthday! On this day, you celebrate yet another year of receiving the gift of life! May it be filled with happiness and joy, laughter and love! Happy Birthday! Growing old doesn’t mean you necessarily get shut off by the world, it’s the exact opposite! Now that you’re older, you automatically gain the respect of anybody! Happy Birthday! 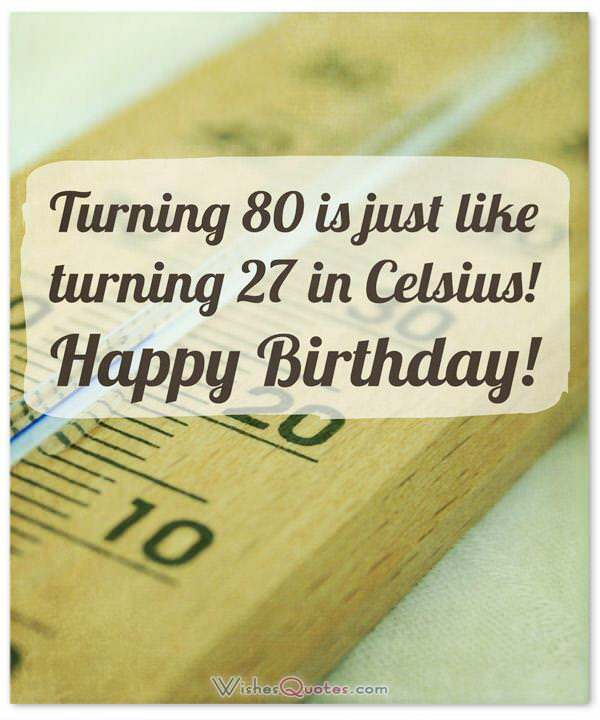 Turning 80 is just like turning 27 in Celsius! At 80 years old you can still chase girls although you wouldn’t remember what for, but you are still chasing them. Happy 80th Birthday!